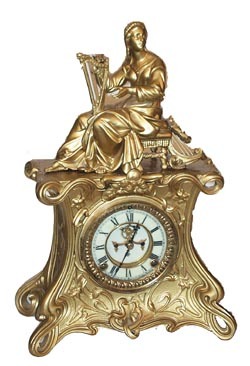 Ansonia Clock Co. metal case clock, "Miranda and Figure No. 1008", ca 1904. Came from the factory finished in Barbedienne or Syrian Bronze. Cameto me with a new coat of gold-bronze colored paint. It looks very nice andwith a little effort it could be made to look like Syrian Bronze. I thinkthe experts use some kind of toner and rub into the repainted metal. Thetwo pieces stand almost 17 inches high, is all there with a shining backdoor, correct pendulum, and a recently cleaned and oiled movement, runningstrong. It is an 8 day movement, striking a gong on the half hours. Frenchsash, 2 piece porcelain dial, open escapement, all perfect. Not perfect isthe sorry glass some cheapskate put in the refinished clock, rather thana correct beveled glass. Two people advertise in the NAWCC Mart that canfit you a nice beveled glass for about $25. Ly-Ansonia No. 1505.